My 1-2-3 Cents : Shut Up, Michael Cole! 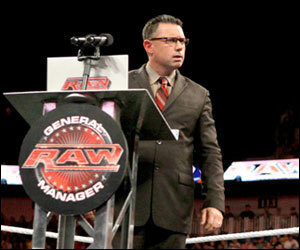 Now Michael Cole has won that honor. I've never been a big fan of his, but now this new "heel" version of Cole is annoying as hell. Again, I know this is a character, but I think he plays it a little too well. He's over the top. As an announcer, even as a heel, you're supposed to call the action in the ring. Watch Raw from Monday, February 7th. Whenever there's a "guest" announcer at ringside it turns into an interview and not calling a match. This isn't necessarily Cole's fault, but during that tag team match with the Miz & Ted DiBiase vs. Daniel Bryan & Jerry 'the King' Lawler, he wouldn't stop the Miz love fest. We get it, you like the Miz. You don't like the King. Move on and call the match, which is what you're supposed to be doing. I would think the "voice of the WWE" would know that. Please JR come back. Other observations on Cole, it's okay to have a heel announcer. There have always been announcers pulling for the "bad guys." Jesse Ventura, Bobby Heenan, and JBL instantly come to mind. There was obvisiouly something different about them. They put over the heel without sounding like they had a school boy crush on them. I've been watching some old school WWF DVDs lately and I miss the Jesse-McMahon and Gorilla Monsoon-Bobby Heenan match calling. Even the Jim Ross-King stuff from the Attitude Era was right on. Also having Cole be the mouth piece for the anonymous General Manager adds to this frustration. Again, I realize this is a character, but I've seriously had my fill. He can be a heel without being so obnoxious. And the fact that's he's "calling" matches on SmackDown! and feels the need to argue more with the other members of the team makes it even more irritating. I think Cole has taken his new role as the heel too far. Jesse and Bobby never once made me want to fast forward through what they were saying or change the channel. I can't say the same thing about Cole, can you? A guy can dream right? Don't sign me up to be a Cole Miner anytime soon. Thanks for reading. Check out My 1-2-3 Cents on YouTube too! Subscribe there and comment. The big change here from announce teams in the past is this - I think this is the first time where the play-by-play guy is the heel. Typically it's been the color analyst (Ventura, Heenan, JBL) that is lending just that, a little color, flair and opinion which normally sided with the heels, to the broadcast. When the play-by-play guy is in full heel mode, he's too busy trying to give opinions to get over as a heel to call the match. Bad idea and it's not working in this case at all. Love seeing someone honored for a good job. Haven't seen your blog before so I'll check in from time to time. I'm sure it's been said already, but this heel turn for Michael Cole, has ruined Cole's career. I mean, there is no comeback from this. You can't just magically hope people forget about this and attempt to have him turn face again at some time in his career. Its almost like Vickie Guerrero. She has gone so overboard with her character, there is no turning from it. The moment her or Cole is gone. They. Are. Gone. Nobody will want them back. The WWE will get blown up with calls, letters ect by the pure rage and hatred of the WWE Universe if they ever return. I hope they get some good compensation. Because when they go, everyone will hope to never see them again. On a side note; Jim Ross proves he is still the voice of the WWE as he commentates with King back in WWE All-Stars. But I'm new here so I'm sure you already knew that. I hope JR comes back and punches Cole's teeth down his throat for King. Currently he is the only one willing and able. Nobody in the WWE really calls matches anymore. They've all but completely done away with simulating the feel of a sport to concentrate on non-stop promotion. Cole could be replaced but it wouldn't matter. They would still have to shill whatever the backstage script reader tells them to shill. Although I've never been a Cole Miner either, it's unfair to hold him responsible for company business practices. Jesse Ventura, Bobby Heenan, and JBL instantly come to mind. There was obvisiouly something different about them. They put over the heel without sounding like they had a school boy crush on them. Having a heel commentator is all part of the fun. The problem here is Micheal Cole is the main commentator. The heel tends to be the second banana and chips in his two cents worth from time to time. But now we're stuck with listening to it constantly. You're supposed to not like this character, but with Cole you not only don't like him you would do anything to get him to shut up. I'm disappointed they've let it run this long without having a confrontation that results in him turning down the annoying dial. Maybe at Wrestlemania if/when he faces Jerry the King Lawler. Putting Cole on Smackdown just makes the problem worse. Now there's no relief. It makes me either not want to watch or I have to watch the show on mute.